What do the Lynx need to do to repeat? Julian Andrews, Web Editorial Associate: The pieces are in place. With last year’s championship starting five all returning, the Lynx know they have a core that can win at the highest level. The biggest question is what happens when the stars are on the bench. From the first few days of camp, it seems like Danielle Robinson, Tanisha Wright and Lynetta Kizer are fitting in very well, and that’s good news—their contributions will be crucial. There’s been a lot of talk about the team’s reserve backcourt, and for good reason. Robinson and Wright should be more than capable of holding down the fort, and Alexis Jones will play a larger role as well. But the more interesting question is what will happen up front—coach Cheryl Reeve seems encouraged by Kizer’s ability to defend both the four and five spots, and her shooting will give the team a nice stretch presence off the bench, but behind her things are a little less clear. Temi Fagbenle and Cecilia Zandalasini have a real opportunity this year to step up and play key roles. A breakout year from either one of the talented young forwards would give the Lynx a major boost. Seth Auger, Social Media Associate: Let’s be honest, the Lynx absolutely have five superstar starters on the squad. Let’s be even more honest, our superstars have been in the league for a long time. This year will be Brunson and Whalen’s 15th season, Augustus’ 13th season, Fowles’ 11th season and Moore’s eighth. Reeve may want to watch each of their minutes a bit as it’s obviously important to not be extremely tired come playoff time. This leads into relying heavily on the minutes the bench players can provide. This offseason, the Lynx bench lost Jia Perkins, Natasha Howard, and leading bench-scorer Renee Montgomery (7.0 PPG). However, they landed 12-year veteran Wright, three-time WNBA All-Star Robinson, and also signed Kizer and Endy Miyem. Having the veteran and All-Star presence of Wright and Robinson, as well as relying more heavily on Jones off the bench will be huge in making another run for a Championship. Kyle Ratke, Digital Content Manager: The Lynx are the gold-standard of the WNBA on and off the court. They’ve won four titles since 2011 and players want to play here. That’s why we saw Perkins in 2016 and Plenette Pierson last season so willingly join the team, and why we saw Robinson smile after being traded here this offseason. 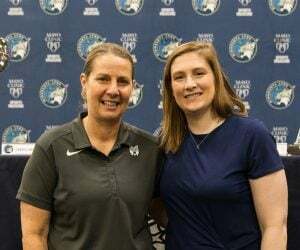 Oh, and the opportunity to play for the Lynx got Wright to COME OUT OF RETIREMENT! The Lynx should be the favorites to win the 2018 title, but it won’t be easy, obviously. The Sparks are right there as well, and the Lynx can’t pump the brakes at all if they want to repeat for the first time in team history. The core of this team isn’t getting younger, but Moore, Fowles and Robinson are still in their primes. I don’t look at this as the beginning of the end, or the end of anything. I think we’re right in the middle of another string of championships. Brunson is in incredible shape, Whalen is one of the most-competitive people ever and Augustus has become such a great all-around offensive player. She dished out a career-high 4.0 assists per game last season. She also made her seventh All-Star Game appearance. Biggest Offseason Move And Why? Auger: The biggest offseason acquisition for the Lynx has to be Robinson. When Montgomery left to sign with Atlanta, it was important for Reeve to replace her with another quality point guard, and boy did she ever. Robinson is a fierce defender and a veteran leader. She is definitely one of the most unique players in the WNBA due to her ability to do many things on the court. Offensively, she can create shots for her teammates by attacking defenses, as well as create shots for herself with her exceptional quickness. Speaking of quickness, she is known around the league as a tenacious, quick defender, and that has earned her WNBA All-Defensive Team honors in 2012, 2013 and 2014. When you combine that with her three All-Star appearances, and the reputation Robinson has around the WNBA, you do everything you can to add her to your team and you don’t look back. Ratke: I think most of us would agree that Robinson is the pick here (although, again, Wright coming out of retirement is epic). This is huge for a couple of reasons. First off, you’re filling Montgomery’s role at backup. But you’re also getting a three-time All-Star who is only 28 years old. She’s probably the fastest player in the WNBA and will put immense pressure on an opposing defenses, especially with such a talented cast around her – the most-talented group she’s been around throughout her career. Seth touched on Whalen not getting younger (that’s not a knock, that’s how time works), and we’re not here to speculate, but it looks like Reeve put on her GM and coaching hat when making this move. It’s a win-now move, but also a move that should benefit the team moving forward. That’s a testament right there, folks. Andrews: In this case the most obvious answer is the right one, and though I’d love to get creative and pick someone else, I have to agree with Seth and Kyle and say Robinson. She’s so, so fast. I watched her in practice the other day, and she just has the look of someone who can literally run circles around the opposition. She’s been nicknamed ‘Lightning’ by Sylvia Fowles (who is Thunder). It’s also very obvious that Robinson’s teammates really like her and enjoy playing with her. That’s incredibly important. Though Whalen will remain the starter, it’s not unlikely that Robinson ends up playing a similar number of minutes. 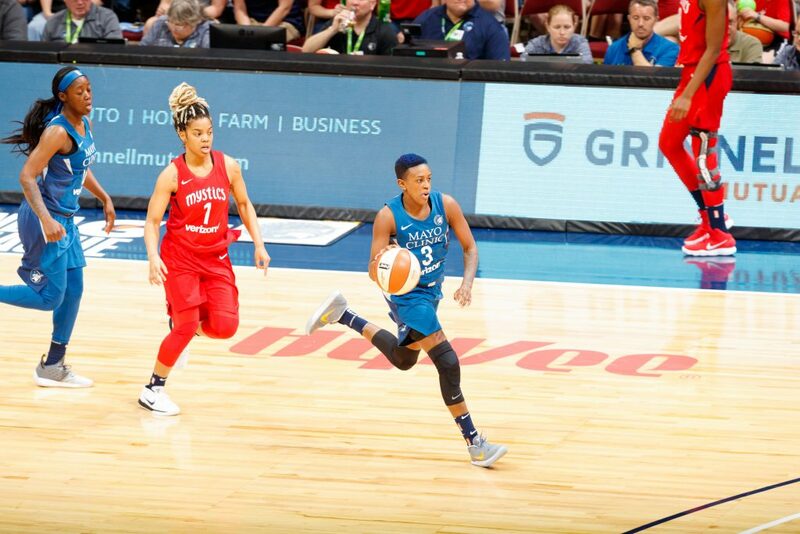 Robinson gives the Lynx a completely different look that will force opposing teams to fundamentally adjust their defense when she checks in—and she’s a phenomenal defender herself. I suspect the Robinson steal into fast break will be good for at least a few buckets every game. Just to shake things up a bit, I’ll mention something quickly about Wright. She came to the Lynx because she wants to see the court—and she will—but her mentorship of Alexis Jones could help Wright’s impact on the team last far beyond this year. If Wright can help Jones develop on defense as well as playing the defense she’s known for herself, opposing bench units are going to HATE playing Minnesota. Don’t Forget About Maya Moore . 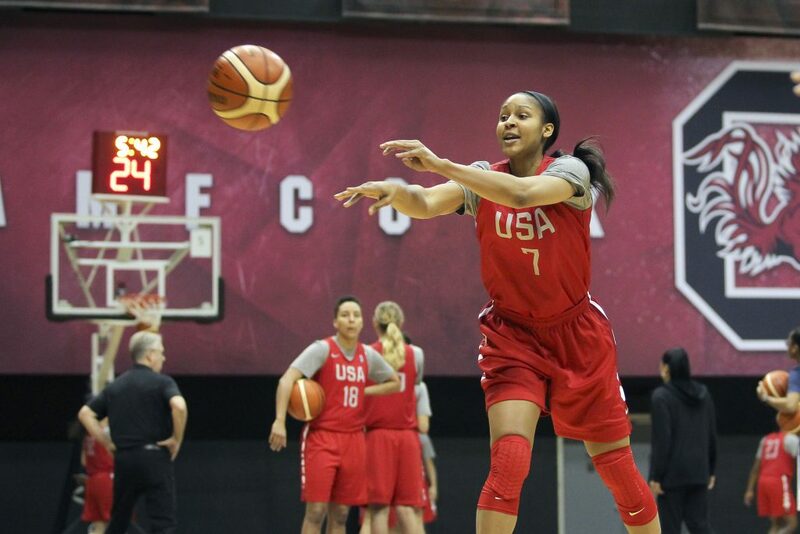 . .
Ratke: Nobody’s forgotten how good Maya Moore is, right? With how many great players the Lynx have, I guess it’s tough to keep track sometimes. But it’s Maya Freaking Moore. She’s still the foundation of this team. Moore’s numbers were a little down last season, but she still averaged 17.3 points, five rebounds, 3.5 assists and 1.9 steals per game while shooting a career-high 41.1 percent from the 3-point line. She’s still a top-5 player in the league and is a threat to win MVP every season. And she’s only 28! That’s all I got. I’m just annoyed we don’t hear Moore about Maya (delete me). Maybe we’ve taken her for granted? Andrews: Moore spent the offseason beating all the competition Europe had to throw at her. There’s no denying her talent—she’s incredible. Hopefully she’s still managed to stay fresh for Lynx season. There’s more than enough talent surrounding Moore on this team to help share the load if she needs to play fewer minutes any games this season, but if things get rough at any point for the Lynx she might be the one to have to carry them for a few games. As Kyle pointed out, Moore is young, so fatigue shouldn’t be an issue. 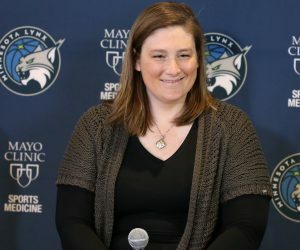 Reeve is also very good about making sure her veterans are mentally and physically ready for the season before they return to practice, so Moore will have had some time off before she returns to the Lynx. The only thing to do is believe that Moore will be totally ready to lead the Lynx this season. We’ve seen nothing to suggest otherwise so speculating would be disingenuous. She’s certainly earned the benefit of the doubt. With some of the other Lynx veterans likely planning on seeing their minutes dip a bit, Moore could be in for a career year. Auger: Where to begin? We haven’t been able to see Moore practice with the team so far this season, but only because she is too busy winning championships overseas. The greatest winner in basketball history should arrive back in Minnesota sometime next week, and if there’s anything we know about Maya, it’s that she will be ready to get this season underway. Although she had a bit of a “down” year last season (I wish my down years were that good), I believe one of the best seasons of her career is in store this season. She has everything you want in a superstar player, and has the surrounding cast around her to make her even better. As Kyle pointed out, sometimes we take her for granted. Let’s not let that happen this year. Buckle up and enjoy the ride. The Home Opener Is Going To Be Great, Isn’t It? Andrews: So many storylines! The Lynx haven’t lost their home opener since 2010, and this year they will defend that streak against none other than the Los Angeles Sparks, who they defeated in Game 5 of the WNBA Finals last year. Outside of the drama surrounding the game, this one should just be an all-around phenomenal basketball game. We’ll get to see a battle in the frontcourt as Brunson and Fowles play against Nneka Ogwumike and Candace Parker, Moore will be working to score against defensive stud Alana Beard, and Odyssey Sims and Whalen will be going head to head again after both turned in excellent performances in the 2017 playoffs. 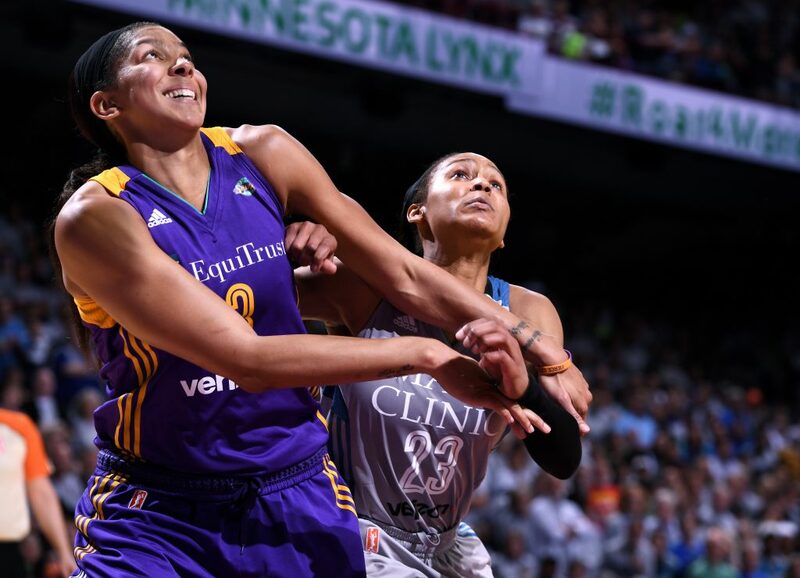 The Sparks will come in looking for revenge, and anticipation surrounding the Lynx season is at an all-time high. This team expects to be excellent, and their fans expect wins. It’ll be great to see right off the bat how the Lynx, who have incorporated several new pieces in the offseason, stack up against a team they very well could see in the finals again this year. The fans will be nuts, the players will be pumped up, the Lynx are back in the renovated Target Center, it’s going to be a night to remember. Auger: Name something better than raising a championship banner in front of a roaring crowd and the team you beat to win the championship, all while playing on a new court with new uniforms and the same superstar faces? Kyle would probably say Cheez-Its, which I can’t argue with. Other than that, it’s an unbeatable feeling, and we all get to witness it in a short couple weeks. And this is all before the game even tips off! Are you excited yet? The game itself should be nothing short of exceptional, with both teams packed with All-Star talent. Of course, our starting five can compete with anyone in the league, but so can theirs. With players such as Parker, Ogwumike, Beard and Sims, there’s no wonder why this has become the greatest rivalry in the WNBA. It wouldn’t come as a surprise to see these two teams meet again in the Finals, so it will be interesting to see on Opening Night how the Lynx will fare against this great Sparks team. 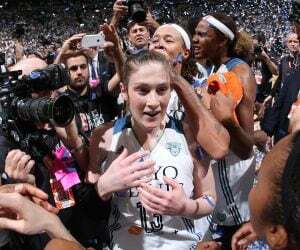 One thing is for sure, Target Center will be rocking, and my guess is that the Lynx players will be as well. Ratke: Yes, it is going to be great. This is for a few reasons. The first is that the Lynx are unveiling their fourth championship banner. That’s significant. And they are doing it against the team they beat in the Finals last season, the Sparks. While it’s not common to have a champion face the not-champion in the season opener, it’s not the first time it’s happened, much to Parker’s dismay. 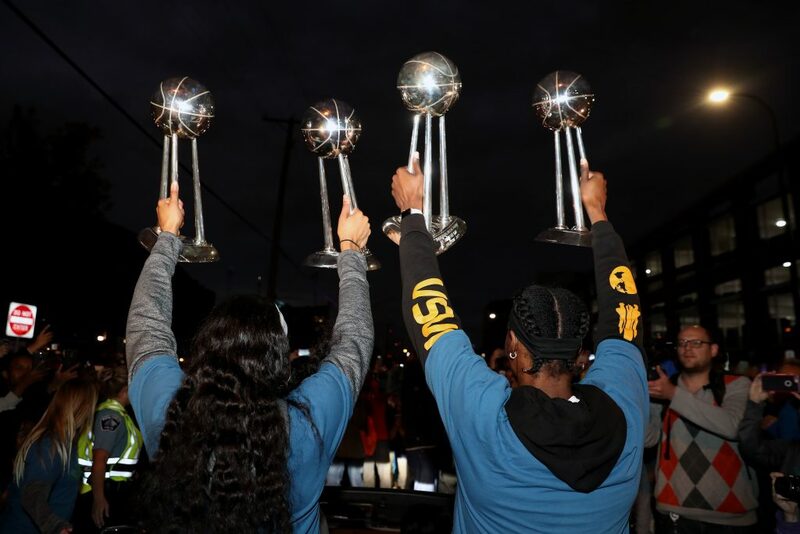 A tad disappointed that the longest standing women’s sports league (WNBA) takes the lead ahead of other major sports leagues (NFL NBA MLB NHL) in doing something none of them would ever do….. make the runner up team watch a ring ceremony that could of been theirs. The Broncos showed off their trophies to open the 2016 season against the Panthers, the team they beat the previous season. It’s not the greatest feeling for the opposing team, but if the Sparks had won, they wouldn’t have to worry about that. This is something the Sparks should use as motivation, and they likely will. 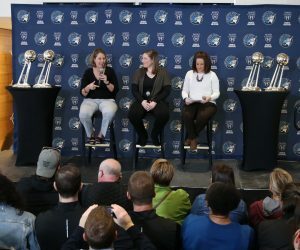 The Lynx will be riding high on emotion, but after the ring ceremony and banner unveil, there is indeed a game that needs to be played. It’s also the first game at Target Center since the 2016 season due to the renovation. Let me tell you, the Target Center feels new, it’s awesome and the seats are 8/10 on a comfy scale. This will be a fun season, and the Lynx are hoping they can wrap it up with a ring for every finger.